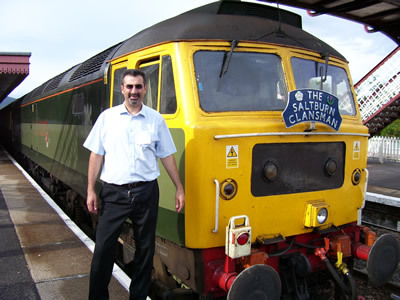 Saltburn Railtours is a railway organisation, based around the town of Saltburn, using the goodwill and time of a few dedicated organisers. We are all rail enthusiasts, who enjoy rail travel in general, and somehow stumbled upon the idea of Saltburn Railtours following a successful Saltburn Victorian excursion to Boulby Mine back in August 1995. Since then we have organized many other tours to different locations within the United Kingdom. Our 15th tour is due to take place in June 2017 (see below). We offer a Pulman dining rail tour once a year, with a full at seat service. Your luggage will be put aboard on the station and then you can sit back in your seat and watch the wonderful scenery float past as you are served by our experienced and friendly stewards, who, like us are all volunteers. Once at your destination you will be taken to your chosen hotel, where you will stay on a bed and breakfast basis for 3 nights. You are free to explore or to totally relax, as you wish, but with the comfort of knowing that our staff are always on hand if you should need assistance. Next year we are going to be incorporating a wonderful show for you which we are sure you will enjoy. Copyright © 2012. Saltburn Railtours. All Rights Reserved.